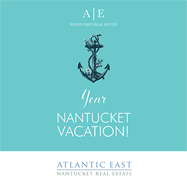 Atlantic East charges no extra tenant processing fee! A magnificent eight-bedroom summer home located across the street from the path to the calm harbor beach. Wonderful Brant Point location, close to Town and Jetties Beach. All new furnishings in 2010.